OmniPlan: Project planning made painless. Free 2-week trial. OmniPlan is designed to help you visualize, maintain, and simplify your projects. Break down tasks, optimize the required resources, control costs, and monitor your entire plan—all at a glance. Collaborate with your colleagues and share every detail, update a calendar with your days off, or mix and match. Accept and reject changes one-by-one or all in one go. OmniPlan provides features like Gantt charts, network diagrams, schedules, summaries, milestones, and critical path highlighting to let you manage projects that are as simple or complex as you need them to be—without the complexity. With the free two week trial, you can try all of the features of Standard and Pro without buying anything. After the trial, you can continue to use OmniPlan to view documents for free. 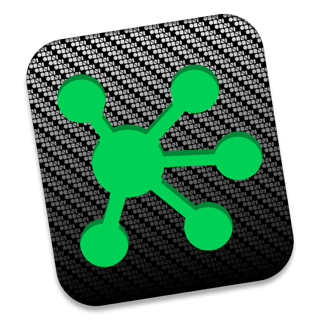 • Network View [NEW! 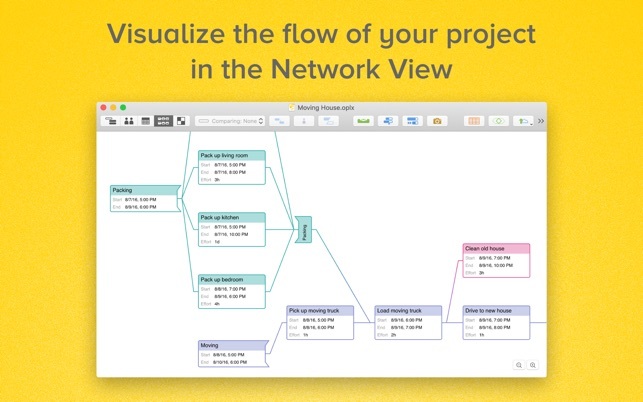 ]: Quickly create network diagrams by connecting task nodes based on their interdependent relationships, so you can see the big picture without sweating the small stuff. 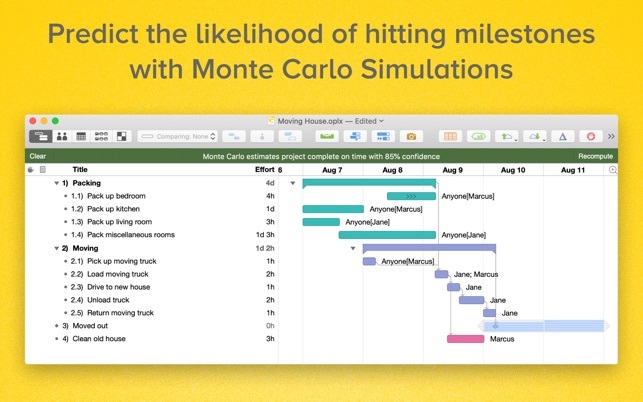 • Task View: Add groups, tasks, and milestones while defining important details in the work breakdown outline and watch OmniPlan transform the timeline of your project into a beautiful Gantt chart. 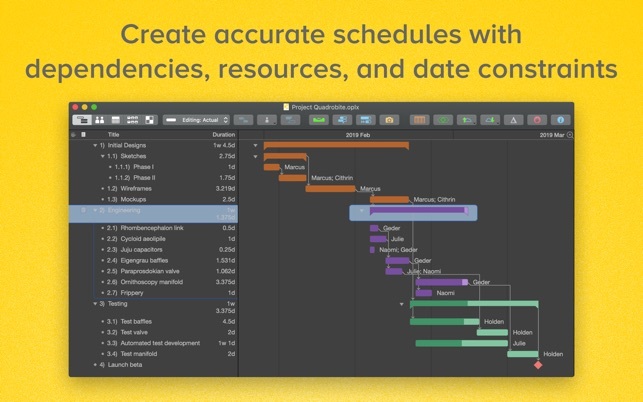 • Smart Scheduling: With two clicks, OmniPlan will analyze and schedule tasks on-the-fly for maximum efficiency, all while keeping your resource schedules and priorities in mind. 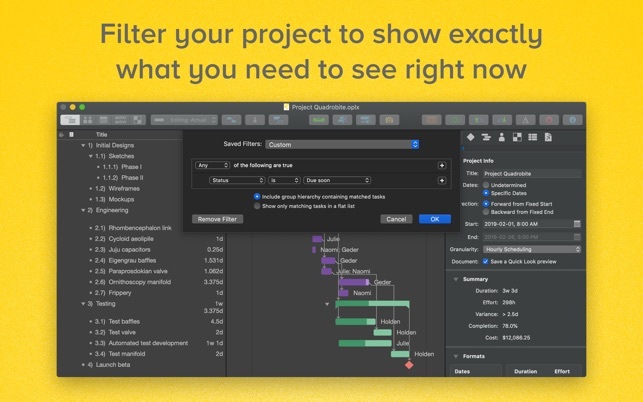 • Filtering: Hide unnecessary project details so you can focus on work that matters right now. • Multiple Baselines: Take snapshots of your schedule, then compare them as your project progresses to make sure you're still on track. 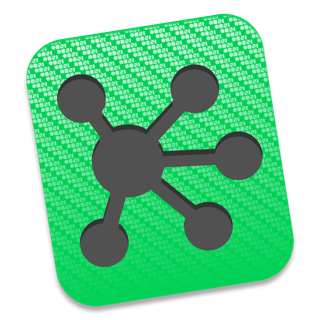 • Split Tasks: Split up your current task and move the remaining work to the future. • Violation Resolution: If your schedule has a logical impossibility, OmniPlan will find it and suggest the best course of action to restore order. • Critical Path: Flip a switch to highlight tasks that have the biggest impact on your deadline. • Exporting: OmniPlan documents can be exported as PDF, CSV, OmniOutliner, OmniGraffle, ICS, and more. 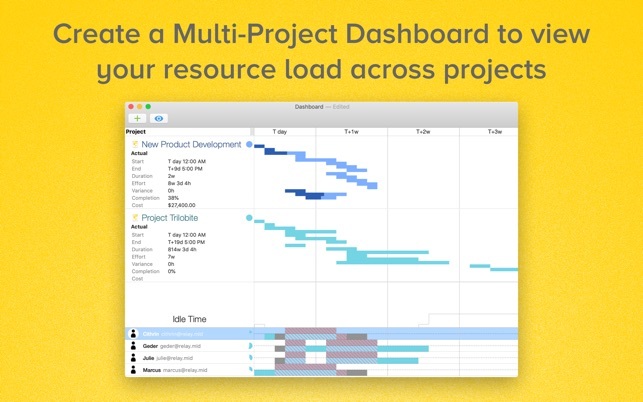 • Multi-Project Dashboard [NEW! ]: Assemble a beautiful dashboard to review your projects at a glance, and see how busy or idle every team member is across all of them. • Earned Value Analysis [NEW! ]: Time is money! 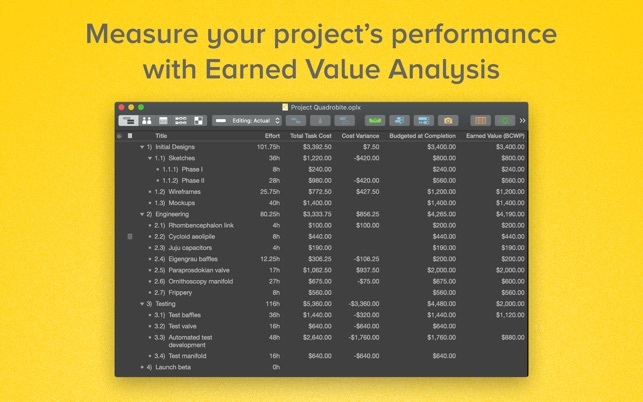 Measure progress at any point in the project and forecast its completion date and final cost, without having to remember all of those EVA formulas. • Auto-Effort Estimation [NEW! ]: Let OmniPlan assign your best and worst estimates to account for every scenario. • Monte Carlo Simulation [NEW! ]: Run multiple simulations in seconds to forecast milestone completion dates with varying levels of confidence. 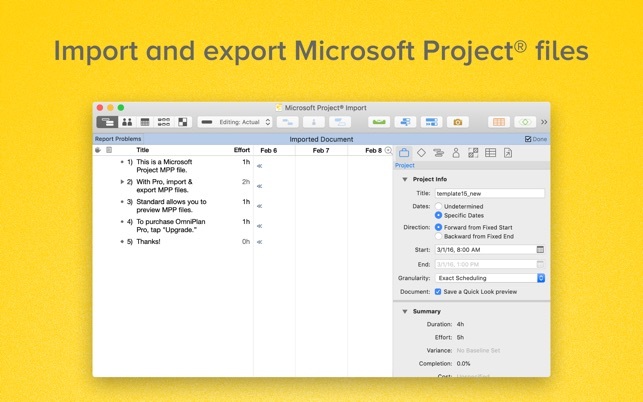 • Microsoft Project Import/Export: Open Microsoft Project® 2013 or earlier documents directly in OmniPlan and export to Project 2013. 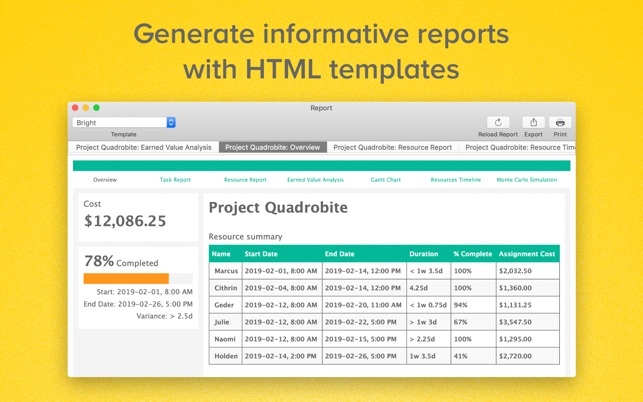 • HTML Reports: Generate project reports with a single click! We've created gorgeous, customizable HTML templates that are dressed to impress at your next status meeting. 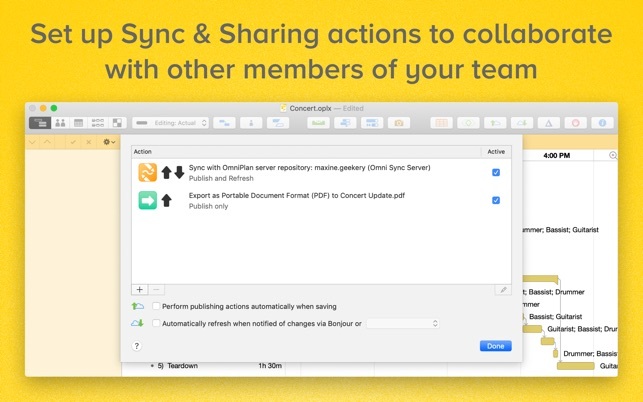 • Publish & Subscribe: Sync your entire project to the Omni Sync Server or to your own WebDAV server. Make changes to your project and sync to see those from your collaborators. • Change Tracking: Keep tabs on and review the changes you've made in your project so far. If you're syncing, use change tracking to review, browse, and then accept or reject changes task by task or en masse from your collaborators. • AppleScript support: Create AppleScript shortcuts for complex tasks and automate the things you do over and over. If you have any feedback or questions, we'd love to hear from you! The Omni Group offers free tech support: you can reach us by email at omniplan@omnigroup.com, by phone at 1-800-315-6664 or +1 206-523-4152, or on twitter at @omniplan. 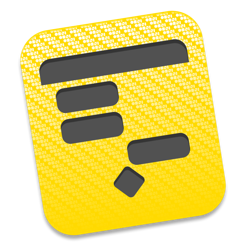 OmniPlan 3.12.1 is a minor update focused on bug fixes. • Change Tracking — The Hide Changes menu item once again hides the Change Tracking status bar as well as the Change Tracking sidebar. • Effort Calculation — Effort in weeks is now calculated properly in projects with daily granularity. 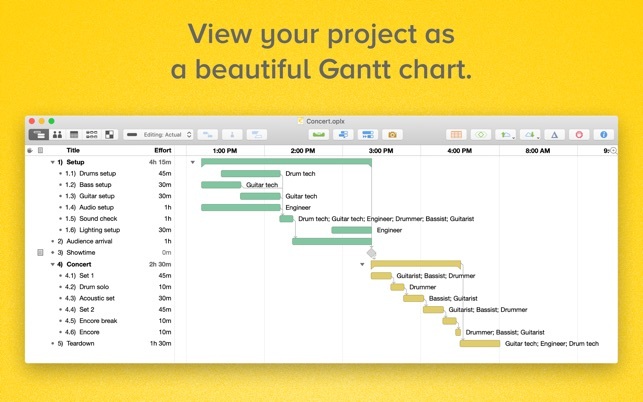 • Gantt — Completing a milestone in a group is now immediately reflected in the group task bar’s completion state. • Layout — Addressed a few interface layout issues that were introduced in the previous release. • Printing — Fixed a bug that could cause group and hammock tasks to draw incorrectly when printing to PDF. • Scrolling — Chevrons in Gantt now scroll properly when task outline is scrolled. • Stability — Attempting to cancel publishing no longer crashes. • Stability — Fixed a scheduling crash. If you have any feedback or questions, we’d love to hear from you! The Omni Group offers free tech support; you can email omniplan@omnigroup.com, call 1–800–315–6664 or 1–206–523–4152, or tweet @OmniPlan. If OmniPlan empowers you, we would appreciate an App Store review. Your review will help other people find OmniPlan and make them more productive too. I strted using Omniplan because a vendor was able to turn around schedules for me very quickly and they really liked it. I started with the standard version but later upgraded to the pro version when I needed the extra features—and I’m really glad I did. I’ve read some bizarre reviews that imply that Omni is trying to push the app as ‘free’ and then upsell you directly to the pro version—that’s nuts. Nobody is going to give you an app like this for free, and they really bend over backwards to let you try the app before you spend any money; far less money than what microsoft asks for MS Project. This app is simple enough to learn the basics and start putting out informative plans very quickly but it has a lot of features that you can uncover over time as you need them. There may be a few things I’d still like to see, but overall the product is reallly well designed and robust and I’ve built up a group of templates that now dramatically shorten the time it takes to develop plans and cost them out. I’ve been using project planning software for a long time (since the 90’s) and this is the best design I’ve seen. I recommend it to everybody who asks. I have both this and OmniGraffle as I wanted to be able to view and work with Project and Visio documents on my MacBook, and there are no versions of these products from Microsoft for the Mac (and I don’t want to deal with a dual-boot setup). I’ve been happy enough with these both, though I will still be doing a lot of polishing and collaboration in the Microsoft products with these documents. The vendor has been VERY engaged when I have reported bugs and have asked for example documents so that they can do QA. These products are good now and I am very optimistic that the vendor will work to correct some of of the import/export problems that I see, which are relatively minor. Given that its sold into enterprises - folks wanting an alternative to MS Project… only having in-app purchases is impossible since VPP (Volume Purchaes Program) does not support that. And don’t ask me to go through a two month vendor management review to add a vendor to buy this direct - not to mention that tracking licensing for non-app store apps is a major pain that we try to avoid wherever possible. It would be useful to submit 2 apps - one a direct purchase and one an in-app model. Off to look at other options. We’re really sorry to hear that our purchase model prevents you from being able to purchase OmniPlan! By distributing OmniPlan as a free application, we’re able to offer a trial period of the application as well as discounted upgrade prices to customers who purchased a previous version of OmniPlan. Unfortunately, relying on In-App purchases currently prevents us from distributing OmniPlan licenses via the VPP store. This is something we’ve let Apple know we’d like to be able to do, and if you’d like to provide Apple with that feedback as well, we’d really appreciate it! You can do so at apple.com/feedback. We’ll keep your suggestion in mind as we continue to evaluate ways to support enterprise customers. Thanks!